We woke up early this morning to go on a walking tour of the Heritage House, visit the Bull Temple, and eat lunch at Vidyarthi Bhavan. We woke up early this morning to go on a walking tour of the Heritage House, visit the Bull Temple, and eat lunch at Vidyarthi Bhavan. Our guide for the walking tour was Mansoor Ali, and he gave us a brief overview of the history of Bangalore before showing us through the Heritage House, a historical building which still stands in its original form with no modification, adding to its grandeur and relevance as an instrument of education for our group. We explored a local market, observing traditional practices of grinding rice into flour and seeing the various goods and services offered throughout the city. Later, we got lunch at Vidyarthi Bhavan, which is a restaurant known for affordable dining, and originally served students on a budget; the food was delicious, and everything on the menu was under fifty rupees, which converts to less than one U.S. dollar. At the Bull Temple, we had the opportunity to learn more about Hinduism and the importance it holds in Indian culture, and we made a puja, or prayer, inside the temple itself. Before leaving the temple, we saw a group of locals taking wedding photographs dressed in traditional Indian ceremonial clothing, which was a beautiful and unanticipated addition to our cultural immersion experience. 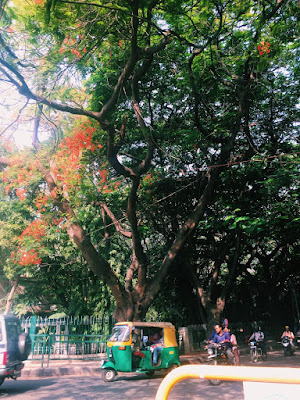 At the hotel, we spoke with an urban planning expert who explained the processes associated with implementing meaningful changes throughout Bangalore in regards to water systems and waste management. That conversation was eye-opening and made me more aware of how complicated the process to make changes is, as there are so many different government levels and agencies responsible for different aspects of public health. Overall, today was extremely busy and educational, and allowed us to observe parts of Indian culture that we otherwise would not have had the opportunity to discover.